When a woman was killed at a Texas amusement park last week, many expected answers from a state or federal investigation. But the federal government has no authority over amusement park rides and as it turns out, Texas does not investigate serious injuries and deaths in these cases. The Dallas woman died when she was thrown from the Texas Giant roller coaster at the Six Flags Over Texas park in Arlington. The amusement park is now investigating her death on its own. According to a NBC News report, in Texas, the state Insurance Department sets regulations for amusement park rides and handles independent inspections of new rides. But annual safety inspections are handled by an inspector hired by the park’s insurance company. The state does not intervene unless the park’s insurance is in question. Many have long sought federal oversight of amusement park rides, which sent an estimated 37,000 people in the U.S. to emergency rooms with injuries in 2011, according to the Consumer Product Safety Commission. As a congressman, Sen. Edward Markey, (D-Massachusetts), introduced several bills to establish that authority over the past decade, but none were passed. 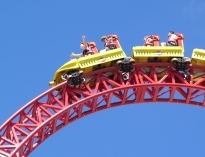 There are uniform safety standards for amusement park rides set by the American Society for Testing and Materials (ASTM), but those are voluntary. Some states do not require any inspection or permit for amusement park or carnival rides. Certain states leave cities to set their own ordinances, while others like Vermont, are satisfied if an operator provides proof of liability insurance. As in Texas, other states require inspection without extensive state oversight, including some with large amusement park industries. In Florida, parks with 1,000 full-time employees can handle their own inspections. We have a few amusement parks in Massachusetts: Six Flags New England in Agawam, Edaville Railroad in Carver as well as Canobie Lake nearby in New Hampshire. Many of us also enjoy carousels, ferris wheels and other rides at visiting carnivals each summer. In Massachusetts, amusement and carnival rides are all regulated by the Department of Public Safety under M.G.L. c. 140 § 205A. Operators are required to provide proof they have obtained liability insurance and have annual inspections. If someone is injured due to a defect in an amusement ride, it is shut down. Injuries are investigated by state inspectors. The insurance company, as well as the Department of Public Health, must sign off before the ride is re-opened. In 2004, the state investigated the death of a 38-year-old man in the spinning Sizzler ride at a church fair in Shrewsbury. Two others suffered serious personal injury. The state determined the man’s lap belt restraint was defective and cited Jaro Amusement for not keeping proper maintenance records.